"Learn about reading blueprints and symbol meanings." Once you understand how to read blueprints, you will be in a better position to review plans, elevations, details and sections of drawings. We've added some free blueprint reading resources below to give you as much information as possible to further your understanding of blue prints. Whether your goal is to learn to read architectural blueprints, engineering drawings, welding documents, landscape plans, house plans, shed blueprints, garage plans, or any type of construction drawings, our goal here is to have you understand how to read these plans and their respective blueprint symbols. There are certain times when it is important to understand what you are looking at, with regards to blueprints. A home owner who hires an architect, designer or drafting firm, is always better equipped to make construction and renovation decisions when they can grasp the basics of blueprint reading. A well developed set of plans will often contain a legend which denotes what many of the blueprint symbols mean. Although sometimes blue prints may contain no reference to their symbol meanings, this can make it difficult for those that are unfamiliar with reading technical plans. We always recommend to our clients that they ask as many questions as possible when it comes to the drawings we produce on their behalf. This can save a client money up front since they will be able to make better informed decisions about their project. Nevertheless, it is always a good idea to understand the basics of how to read blueprints before sitting down with an architect, engineer, contractor or drafting company. A good pocket reference resource covering various disciplines: Architectural plans, structural plans, plumbing plans, site plans, HVAC and mechanical blueprints, electrical blue prints and much more. It is a great resource to have at your finger tips and will teach readers how to understand and read blueprints. This is a good book to learn to read mechanical blueprints. It also teaches blueprint reading basics and is great for using in a machine shop and tool and die courses. 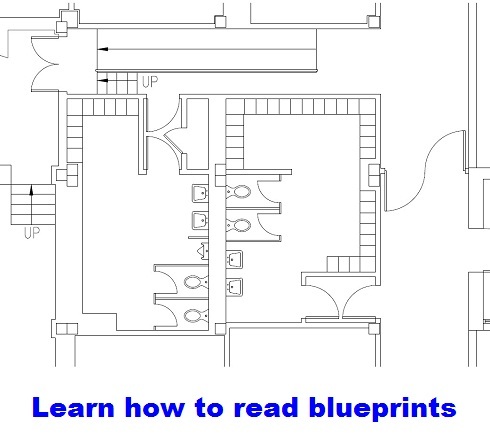 Free How to Read Blueprints Printable Instructions - 200 page PDF ebook that teaches you how to read plans.